Duo Feed is a dual-purpose double feeding bowl and is the ideal accessory for providing your dog with food and water simultaneously, hygienically and safely. 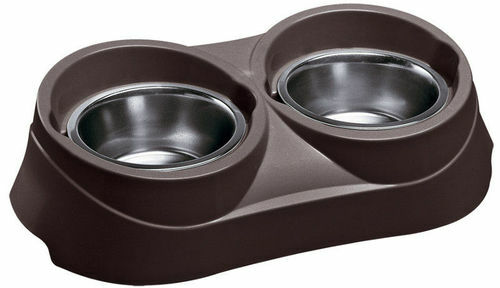 Duo Feed consists of stainless steel feeding bowls and a plastic bowl-holder. The holder has a contoured grip and non-slip stoppers. Duo Feed is easy to clean and maintain, as it is easy to extract the bowls from the base, allowing normal cleaning. In addition, Duo Feed has a special rim, shaped to prevent food or water from falling out of the bowl.